Alaska hunting can best be described by regions. Hunting opportunities throughout the state vary from deer hunting Southeast Alaska‘s coastal rainforest, to muskox hunting on the windswept tundra of western Alaska, to hunting for moose in the hills of the Interior, to high mountain Dall sheep hunting in southcentral, to brown bear hunting the world-famous Kodiak bears. If you are interested in hunting in Alaska, your task is to find the combination of the species you want to hunt, the kind of country you want to hunt in, and how you want to hunt. Southeast’s geography and climate provide conditions for good hunting habitat for a variety of big game. Sitka black-tailed deer are found throughout the region. Black bears are particularly abundant on Prince of Wales and the islands in the central portion of the region. Goats are indigenous to the coast mountains and transplanted to Baranof Island. Moose are not numerous in Southeast Alaska, although reasonable populations are found on the Yakutat Forelands, in the Haines area, and smaller populations near Juneau, Petersburg and Ketchikan. Wolves are found in parts of Southeast Alaska. Much of the guided big game hunting in this region is by boat. Boat rentals are available in some communities for hunters wanting to roll their own. A variety of air charter services with float planes also provide an important transportation alternative. Before you go: Check out the Alaska Fish and Game website. Southcentral Alaska is more varied. Climate ranges from wet along the coast to dry inland. Deer are currently abundant on Kodiak Island and are found in good numbers on the islands of Prince William Sound. These are transplanted deer originating from Southeast Alaska, and as is the case in Alaska, annual abundance depends much on winter snowpack. Kodiak and the Alaska Peninsula are famous for their grizzly bear populations. Moose in parts of Southcentral are currently among the most numerous in Alaska, especially in the Matanuska and Susitna valleys. 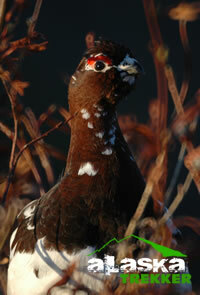 Good populations exist in suitable habitat throughout the region. There are good numbers of caribou in parts of the region, although access is not always easy. Dall sheep are found in the drier mountains in the region, and mountain goats nearer the coast, although there is some overlap. Black bears are not as numerous as in Southeast, but they are widespread. Wolf and wolverine are present. In fact, wolves tend to be numerous where there are good numbers of moose and caribou. Waterfowl hunting can be quite good here, although the effective season is short as birds are moving south. Bird hunters will be pleased to see growing ruffed grouse populations from recent transplants to the Matanuska and Susitna valleys and to the Kenai Peninsula. Moose and caribou are the most visible big game in Interior, Arctic and Western Alaska. This region encompasses the huge area drained by the Yukon and Kuskokwim rivers and draining into the Bering Sea, Kotzebue Sound and the Arctic Ocean. This is relatively dry country, and habitats vary from the forested Interior to the western and arctic treeless tundra. Caribou exist in more or less discrete herds, and some of these herds are huge. Moose are most abundant in western Alaska, but are found in good numbers throughout the region, except on the Yukon-Kuskokwim delta, where they are just becoming established. There are black and grizzly bears throughout the region, but bear populations here are not as dense as in the coastal regions. 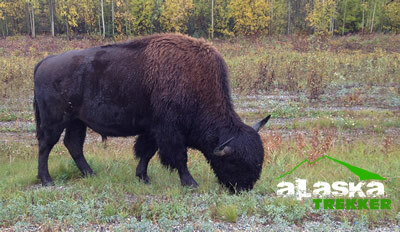 There are populations of wild bison, transplanted earlier in the century from Montana. Dall sheep are found in most of the mountain ranges. Muskox, almost wiped out from Alaska in the late 1800’s. are now present in good numbers in some areas of coastal western and arctic Alaska. Wolves are also numerous in places in this region. It is not uncommon to hear wolves howling on fall evening while sitting around the hunting campfire. Wolverine are distributed across the region. Waterfowl hunting is locally good, but again, only for a short time. Waterfowl begin moving out of the Interior as early as mid-August, several weeks before the beginning of the hunting season. Alaska has 12 species of big game animals spread across 365,000,000 acres – an area one-fifth the size of the entire United States. Big game densities are generally much lower than you are probably used to in more southern states. Many big game species in Alaska make long movements between seasonal ranges. The key to successful big game hunting in Alaska is in doing your homework to determine both the best areas and times to hunt the species you are seeking. For example, in many lowland areas moose are abundant all summer feeding in roadside ponds and sloughs, but begin moving up to less accessible higher elevations in early September, just when most areas open to fall moose hunting. The choice of hunting location in relation to moose movements at that particular time of year can make all the difference between coming home with a moose or not. Caribou have even more pronounced seasonal movements. Caribou hunters traditionally experience feast or famine depending upon whether they are hunting where caribou are moving through, or in an area away from the herd’s location. Doing your homework with local area biologists and air taxi operators can make the difference between success and failure. The Anchorage ADF&G Wildlife Office has an automated telephone that provides information about a variety of wildlife and hunting related topics. The main access number for this system is (907) 267–2347. You can break out of the automated system to speak to a real person during normal state office hours if you don’t find what you need. Alaska is by far the best state for moose hunting. In this area, moose, grizzly bear, black bear, wolf are available in the same season and makes this an excellent choice for multi-species combination hunts. Thanks for sharing this informative blog.